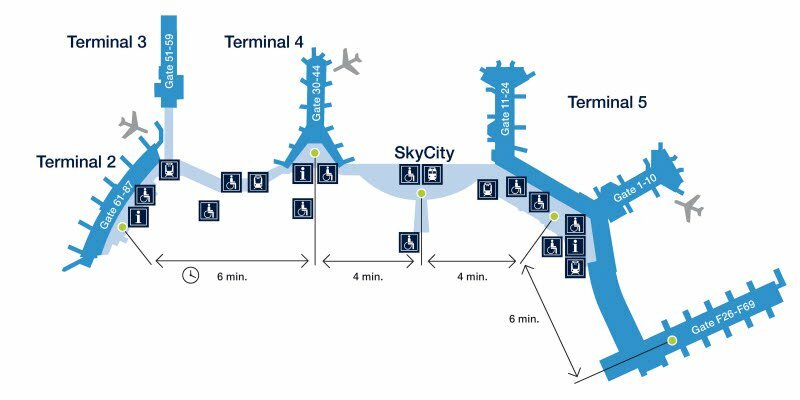 Stockholm Arlanda Airport has three runways: Runway 1 (01L/19R), Runway 2 (08/26) and Runway 3 (01R/19L). Runway 1 is 3,301 m (10,830 ft) long and can handle take-offs and landings of the heaviest aircraft in use today. Runways 2 and 3 are 2,500 m (8,202 ft) long. As indicated, runways 1 and 3 are parallel runways that can be operated independently of one another. Runways 1 and 3 are equipped with CAT III systems for instrument landings. The airport can handle simultaneous take offs and landings using runways 1 and 3 at the same time. Simultaneous aircraft takeoffs and landings can be performed in Instrument meteorological conditions, (IMC). Runway 3 (01R/19L) is reached from the main terminal area via taxiway bridges constructed to be able to handle the heaviest and largest airplanes in traffic. Since runway 3 (01R/19L) is located at a distance from the terminals a deicing area is placed close to the runway to avoid too long time between deicing and take off in winter conditions. Another deicing area is located in connection with the southern ramp area close to take off positions at runway 01L. There are high speed taxiway exits from all runways, except runway 08, to enable aircraft to exit the runways quickly after landing. This increases runway capacity during rush hours. Use of parallel taxiways around the terminal area separates arriving and departing traffic. Arlanda can handle all aircraft types in service including the Airbus A380. The airport has four terminals. Terminals 2 and 5 are used for international flights. Domestic flights are in Terminals 3 and 4. The new central building, Arlanda North, opened in late 2003, connecting terminal 5 with the newly built Pier F. All international flights handled by SAS and its Star Alliance partners use the new central building. An Arlanda South building, connecting terminals 2, 3 and 4 was also planned, but construction is currently suspended due to lack of funds. In the terminal areas and the shopping area "Sky City" there are restaurants, shopping facilities, bars etc. to cater to the needs for passengers and visitors to the airport. There are hotels both at the airport in connection with the terminals and in its surroundings. There are also conference facilities at the airport. Airline Telephone numbers | Stockholm Arlanda Airport ARN Sweden | telefonnummer till Flygbolag på Arlanda flygplats. | International Airlines operating at Stockholm Arlanda Airport, Sweden. | Telefonnummer till Flygbolag på Arlanda flygplats. Airline Telephone numbers for different Airline companies. Arlanda departures information, arrivals. telephone numbers to Arlanda | Airline telephone numbers | Arlanda telephone numbers | International Airlines operating at Stockholm Arlanda Airport, Sweden.